Summer is bit of a lean time for astronomers with late sunset and early sunrise. Many astronomers take a break from the night skies and pursue their other hobbies like decorating the house and sorting out the garden and all those exciting things that always need doing around the house but what astronomy can be done in the summer? By the end of May it does not get completely dark until well after 10 o’clock. During July and August the sky does not get completely dark at all. The midnight sky still has a dark blue appearance compared to the black of a good clear midwinter night. In the mid summer night sky along the northern horizon is a much lighter blue even when seen from southern Britain. This does make any attempt to observe faint deep sky objects like galaxies and nebulae quite difficult. Despite this there are still things for the keen ‘never say die’ astronomer to do. Summer is obviously a good time to observe the Sun especially on hot and sunny days that we sometimes have in summer. We must however always remember that using optical aids such as binoculars and telescopes to view the Sun can be very dangerous if it is not done correctly and carefully. There are three safe ways to observe the Sun with two being reasonably cheap to do. The first method is projection. This can be done with any pair of binoculars or small telescope. If binoculars are used the first thing to remember is to cover one of the lenses so that the light entering that side of the instrument cannot burn any skin or accidentally damage the observer’s sight. 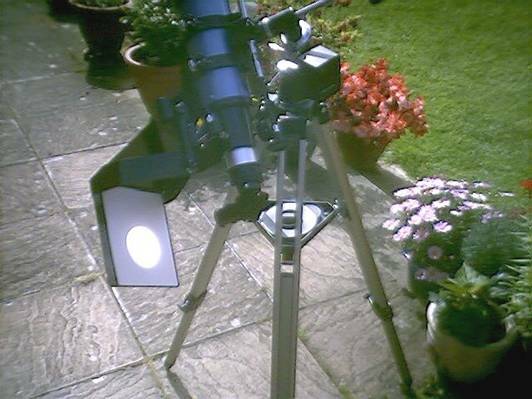 Position the binoculars on a box or stool so they are propped up to point at the Sun. Place a piece of card about 200mm behind the eyepiece and adjust the position of the binoculars until the sunlight passing through the uncovered side falls on to the card. Adjust the binocular focus until the edge of the circular image of the Sun is sharp. The contrast of the image can be improved by fitting a cardboard screen around the binoculars to shield the card from the bright sunlight. With a telescope it will probably be necessary to make and attach a bracket to the telescope to hold the card. This can be done using thin wooden battens or a wire coat hanger and sticky tape or elastic bands. If a more serious study of the Sun is to be conducted something more permanent can be manufactured similar to the screen shown in the image below. Sun spots can be seen and recorded in sketches or can be imaged directly using a camera. Keeping records can be fun and the passage of the spots across the surface of the Sun can be used to calculate the rotational speed of the Sun. Alternatively, telescopes can be fitted with special filters to enable them to be used to observe the Sun safely. 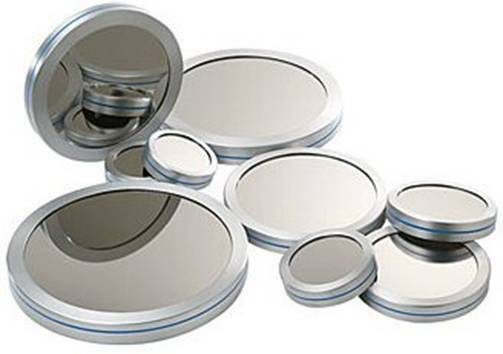 Special solar filters can be bought for most telescopes or can be made. A special filter film known as ‘Mylar’ can be bought in A4 sized sheets and used to manufacture a filter. This type of filter reflects nearly all the light from the Sun and allows only a tiny amount through to the observer’s eye. This direct observing method enables the Sun to be seen in much more detail but can only be used by one person at a time. If Sun spots are present then the eyepiece can be changed to increase the magnification for much finer details to be seen. It is even possible to fix a camera in place of the eyepiece and image the Sun directly. Film or digital cameras can be used but it is necessary to fit an infrared filter to remove the infrared light as this would blur the image. The telescope in the picture above could have the projection screen and eyepiece removed and fitted with a special solar filter and a computer webcam. 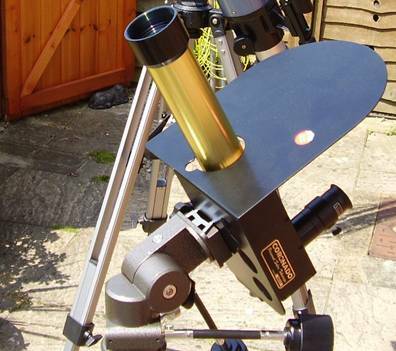 The ‘ultimate’ option is to buy one of the Coronado Personal Solar Telescopes (PST) for about £450. This is a small telescope designed specifically to observe the Sun. It does not use the same type of filter as described previously that reduces all the wavelengths of light. The PST has a very special filter that only allows a very narrow wavelength of light through. The wavelength it does allow through is the light emitted by the very hot Hydrogen gas on the surface of the Sun. This allows much of the solar activity to be seen in breathtaking detail. Prominences or ‘Solar Flares’ can even be seen looking like flames erupting from the edge of the Sun.